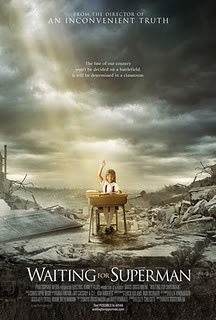 I finished watching Waiting for Superman the other night with an empty pit in my stomach and tears in my eyes. As a former elementary school teacher I knew our nation’s schools were in trouble, but I had no idea how bad it really was. Watching this movie you get to see the pain on the faces of a handful of parents from all over our country, trying to avoid their neighborhood schools to make a better life for their kids. It was absolutely heart breaking. Our public schools are failing. And it is not just the poor schools that are failing, many of the well to do suburbs also have failing schools. Almost 10 years ago, the government took action with it’s No Child Left Behind No teacher left standing legislation. No Child Left Behind brought both democrats and republicans together to help our broken schools. There may be some good ideals within this law but the truth of the matter is you cannot truly make change in education until you rework the entire way we educate children in this country. No Child Left Behind put another layer of bandage onto a very broken system. It added a mandatory test for every school to measure the effectiveness of the law. Schools are failing these tests and so they have been marked as a “school in need of improvement”. They then have to create a plan for how they are going to get out of this status with little to no resources (and a few ineffective tenured teachers on staff). The plan that they create usually is filled with test prep work and when the students still fail they are desperate to make change. That is when they throw their school mission and philosophies out the window and purchase a “Miracle Literacy Program” aka Basal Reader. Now with these new programs any monkey can be a teacher and use the cookbooks to teach the class. Many good teachers are being driven away because their creativity and ideals are no longer valued and you are left with a broken school system with layers and layers of bandages that are not helping one bit. So now what??? The truth of the matter is that most parents cannot afford private schools. The only options other than their neighborhood school is to move, homeschool or pray that their child’s number gets pulled so that they can attend one of the few good charter schools out there. I am one of those parents. My husband was homeschooled and I survived through basal readers in the 80’s. I have taught in two amazing and progressive public schools but even they have been forced to bury their philosophies and beliefs and adopt a “Miracle Literacy Program”. I am at a loss as a parent as to what I should do. Do I send my son to our local public school? We live in one of the top 5 wealthiest towns in our state but our school is still a “school in need of improvement”. The children are flooded with worksheets, basal readers and very little time is devoted to science and social studies. Do I seek out a charter school? We do have a few around but it would be a bit of a commute to get to them. Do I homeschool? I do worry that one child would love this option and the other would not. Do we move?? Where do we go, most of the public schools are headed down the same path of destruction. What do I do???? As a teacher in one of those “schools in need of improvement” I am frustrated and sad. I look back at what we have done, see what we are currently doing and see a bleak future. The “fun” has gone out of teaching, but more importantly, the “fun” has gone out of learning. This year we got one of those “magic literacy programs”. It is in a can (or a box in our case) and anyone could teach it. When asked when we could do Literature Circles, Book Clubs, or read trade books that interest the children, we were told to stick to the program. When asked when we were to do Science or Social Studies we were told that the program is very heavy in Science and Social Studies. We can cross the curriculum when the topic came up in the program. Many of us, those who have been in teaching for a number of years, have watched the education pendulum swing. Lately it has been swinging faster and faster. Everyone has the newest and best program around, all based on research. Talking to these company reps makes you feel like you are buying a new car. “This is what we can offer you, look at all the tech components and extras. Our program is based on RESEARCH!” Well, they are all based on research. In our case, it was the program that was going to give the SAU to most. So, I guess I go back to my earlier question: Where is the fun in learning and teaching? In this high tech world that these children are growing up in, if you want to grab their attention, you need to do more than what these programs are offering. Maybe if a monkey was teaching them it might work better.